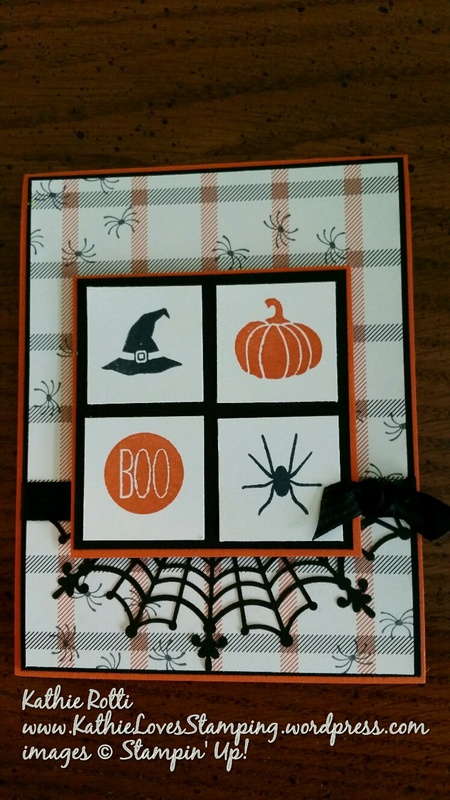 Welcome to the Stampin’ Friends Halloween Blog Hop. If you arrived from Andrea’s Blog, thanks for coming to visit me! Be sure to click on the “next” button at the end of this post to check out Mandy‘s fabulous contributions. Be sure to read this entire post … there is a prize to be won by one lucky blog hopper!!!! The rules are below. I LOVE prizes! This month we have two amazing Guest Hoppers joining us. Be sure to visit them. You will be glad you did. Well, here are my projects. Everything I used is current Stampin’ Up! product. (Well … except for the little wooden spool for the pumpkin’s stem! )The card has super simple layout that can be reproduced for every occasion. 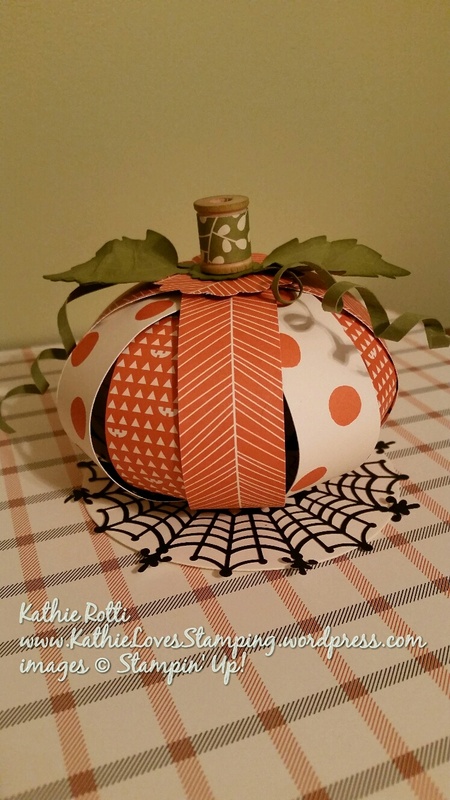 The adorable 3-D pumpkin tutorial was just featured a week or so ago on Splitcoast Stampers. The little pumpkin and the witch’s hat are stamped from the September Paper Pumpkin Wickedly Sweet Treat stamp set (not listed in the supply list at the end of this post). The tiny background spiders are from A Little Something and the rest is stamped from Cheer All Year. A bit of ribbon hides the cut edge of the doily. A tiny knot of ribbon finishes it off. Don’t you just love the super cute Spider Web Doilies? They add a lot of fun to a project. I like to carry over an element from the front of the card to the inside. The spider is suspended from the web with the straight line image from the Paper Pumpkin kit. My 3-D project was something I have wanted to make for a few years and just never got around to it … so easy!!! The 6 strips of Happy Haunting DSP are cut 1″ x 11″ to make the body of the pumpkin. I sponged the edges of the leaves and spool (I found the spool in my craft stash). I used a scrap from the Pretty Petals paper stack to cover the spool. I just cut a sliver of Old Olive and curled it around a skewer for the tendrils. A bit of hot glue, some liquid Tombow glue, fast fuse adhesive and a fine tip glue pen hold it together. Use what works for you! Whoa!! Wait a minute!! There is a prize!!! You will be entered to win a $25 Stampin’ Up! gift certificate (redeemable only through Elizabeth Thatcher) if you comment on EVERYONE’s blog post in this hop. After you comment on all 13 blogs, just email Elizabeth at happystamper508@gmail.com with a list everyone’s favorite stamp set before midnight on Sunday October 18th. Love your pumpkin & your card! Just right for halloween decorations! Adorable pumpkin! And I think Gorgeous Grunge is in my top 5 too! Cute Pumpkin!!! I love it. Love your card. I would never have thought to pull all of the stamp sets together! Loving that pumpkin, I saw it when SCS came out with it, now it’s everywhere. Yours is darling with the curled paper vines! And, the inside of your card is super cool! Wow! Both the pumpkin and the card are amazing! Such an adorable little pumpkin! I’m going to have to try making one myself! Love the itty bitty spiders! Great card! Oooh, I love that pumpkin! Great card too! 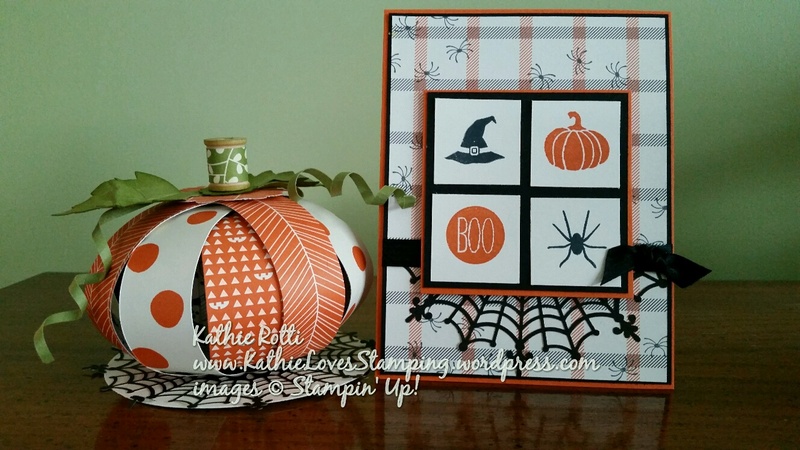 Kathie, I LOVE your pumpkin and your card, i can’t get over how cute that plaid paper is! I would love to make that paper pumpkin. And the card is cute, too. Wow! I love both your pumpkin and your card! Thanks for sharing the inside of the card as well-it’s very striking! Your Pumpkin is so cute ~ I love it. Cute card with the plaid on it ~ I always love to see what is inside. Thanks for showing that too. I think that Gorgeous Grunge is one of my favorite stamp sets in the Annual Catalog too! I keep saying I’m going to try a pumpkin like that and haven’t yet, I am adding it to my list for sure now, I’m in love! Love the card layout!! Very well done. OMG these are adorable. Makes me want to get back in the swing of stampin up. Love your little pumpkin. Your projects are so cute!! !…..Love that pumpkin!! 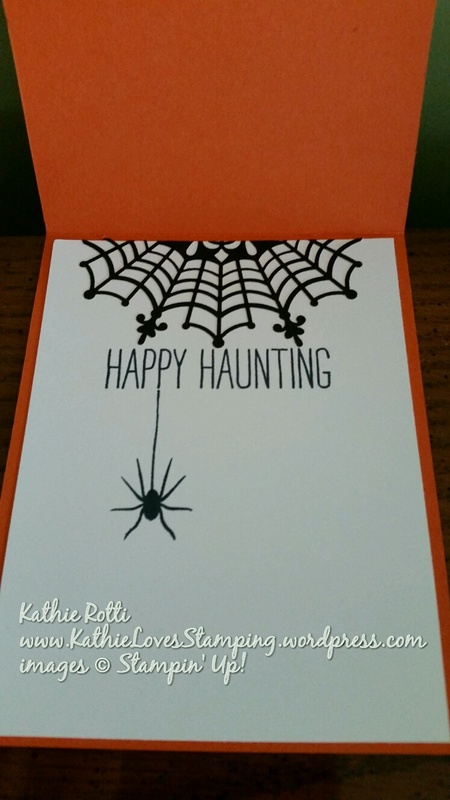 Gorgeous and spooky Halloween card! And your pumpkin is great!